It has finally arrived. The day for which all baseball fans yearn, once their favorite teams play their final game each season. Pitchers and catchers reported for their first official workouts in many Florida and Arizona venues. For many of us, winter has “officially” ended. Especially those of us in Florida who have no weather related criteria to judge the ending of winter. Sorry that might have been wrong of me to gloat like that. Not only do I “suffer’ through mild winters, but I get to see live baseball before friends, family, fans, and readers up north. Yeah, I’m not that sorry. Players stretching. This is as close as we get during their warm ups. 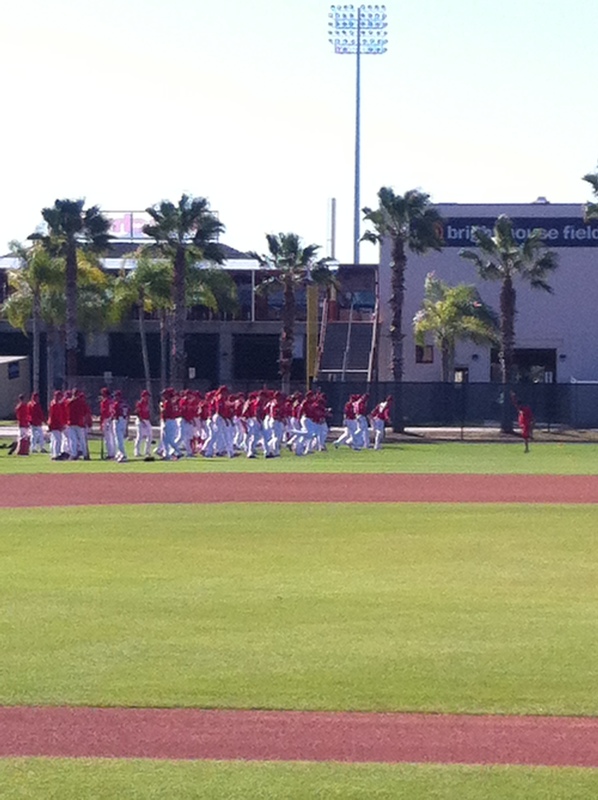 So, today, Thursday, February 18th, several hundred Phillies fans descended on the Carpenter Complex and Bright House Field to watch 60 or more players begin their spring workouts. Yeah, 60! While only 37 pitchers and 7 catchers were required to be here today, It is very encouraging that so many players have reported early. The only players I didn’t see were Emmanuel Burris, Maikel Franco, Ryan Howard, Angelys Nina, Cedric Hunter, David Lough, and Peter Bourjos. This by no means they weren’t here, just that I didn’t see them. Players perform their calisthenics, stretching, and long toss in left field on Ashburn Field and aren’t easily identifiable. It’s entirely possible that they remained at the Complex while the rest of the position players went to Bright House Field (BHF) for batting practice. Which is where I went when the groups split up for pitchers’ fielding practice (PFP). Over in BHF, 15 players batted in three groups of five. I have to admit that I wasn’t paying close attention. I spent some time renewing acquaintances with people I have met at previous spring trainings, GCL games, and Instructs. And these were just at bats against coaches anyway. But, it was good to see Herrera is still hitting line drives. He is probably the hitter I am most worried about. Sophmore jinx and a batting style with a lot of movement and a lot of parts that can get out of sync. Goeddel represented himself well with a lot of line drives and a couple balls into the bullpen. The players I most wanted to see were in group three. This group faced a left-handed pitcher. Crawford and Quinn accounted for themselves fairly well. But Stassi and Williams really stood out. Stassi got jammed up and in on several pitches and muscled them deep to right – two onto the berm and one high off the fence. I was surprised that he got that kind of power on three balls that I thought were going to be routine fly balls. Let’s face it, he wasn’t the guy I was planning on writing about from this group. But even though it was just BP, I was impressed. He didn’t show this kind of power when he was with the Threshers. Williams also jumped out. He had a lot of line drives and easily stroked a few balls onto the berms in left center and right center fields. I was surprised that more guys than Herrera have such an exaggerated leg kick – Stassi and Williams for instance. 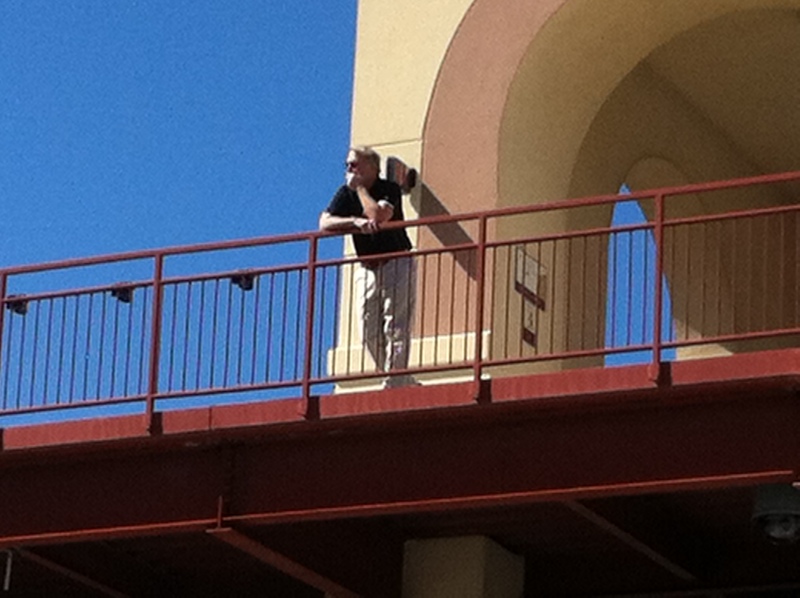 Andy MacPhail watching batting practice with me, sort of. Afterwards, the outfielders ran through some fielding practice with Juan Samuel. The infielders went to the half-field outside BHF for some infield practice. As I walked back to my car at the Complex, the catchers were finishing up their BP. I was parked in the handicapped section behind Ashburn Field. A left-handed batter almost hit my car on the fly. He had the distance to bounce it off my roof if he had pulled it a little more toward the fair pole. I’m sure it was Knapp. Tomorrow, I’m going to stick around for PFPs so I see the catchers hit. I heard that Alfaro launched a few. It was great to see a lot of friends who migarte to the Complex for this spring ritual – David, Linda, Pete, Steve, Gail, Geary (you know him as Gkita who posts video of ST), John, Frank, Stick, Joe, Joe, Betsy, and Ross. What’s the story with #94? No idea. Hinojosa had #94 while with the Boston Red Sox in 2015. He was #23 while with the Pawtucket Red Sox (AAA) in 2014-15.
maybe they retired that number to remember the one year baseball fans were robbed of a pennant race and playoffs. Jim – has there been any update on Shane Watson and Zach Green. Both of these players have fallen off the radar and were considered prospects at one time. I saw Zach Green enter the minor league club house Wednesday morning. I may have seen Shane Watson, but he’s not as easily recognizable for me. I saw Carlos Alonzo, too. Green and Alonzo look like they have rehabbed well. Altherr is better than Goeddel. His defense for sure is superior, and that goes a long way. However, their minor league offensive metrics were closely comparable. I would put Cozens is that outfield mix. In the best of worlds, the Phillies would have a murders row of Franco, Hoskins, Williams, Knapp, and Cozens. We can dream. That’s what we do a lot of here, anyhow. Been reading this website for years. Never posted. I just wanted to say that this is one of my favorite websites on the internet. Nowhere else can you find such a collection of resources about Phillies minor league baseball, or such serious, comprehensive discussions. Admittedly, I don’t know enough to chime in on a regular basis, but all of my opinions regarding Phillies prospects have come from this website. To the author(s)–well done. If sports blog awards exist somewhere, then the producers of this site should be nominated. I’m pretty sure no other team has a website like this; especially considering its active members, daily updates and exceptional first-hand reports. Its truly a treasure. Agree 100 percent. Well said. Post more often. Looks like Adam Morgan may really feel great and challenge for the final rotation spot. For him it will come down to the speed of his fastball. He’s fighting for a spot in a rotation, any rotation. He’s not even guaranteed a spot in the AAA rotation. His velo did touch 92 at times late last year…but he usually sat around 88-90. If he is feeling as strong as he felt prior to the surgery and if can pick up 2/3 MPH, that would serve him well. He’s still a lefty, and in our current LHP dearth, that aspect goes a long way. I’m pulling for him to get back to where he was. He was a favorite of mine among our pitching prospects before the injury. Really hope he can get back, I’m interested to see how this year goes for him. The story about Morgan’s shoulder is an interesting one. He did not have the type of injury we normally talk about as a death knell to a pitcher, such as a rotator cuff or a torn labrum. Instead, it sounded like he had a problem that was more structural, caused nerve problems and that apparently was fixed. He might actually continue to improve as he gets further in time from the injury. He was a very fine prospect by the time he finished his second season – he was projected as a 2 or, more likely, a 3. He threw consistently in the low 90s and was nice and aggressive. If he gains a few miles per hour, he might surprise us all. Gotcha…pick you up at the newsstand. Seriously, there should be a PP meet up during spring training. I’d make the trip over from Orlando. Me, too. I’d love to meet some of these guys. Up from Cape Coral. That would be cool. Eventually when we go big time, we can start organizing PP Official Road Trips (like the big Phillies do now). Week long trip from WPort to Atown to Reading to LW. Charter a bus and include tickets and hotel. Now that would be Awesome!!!! Angels’ owner Arte Moreno…in response to Keith Law’s suggestion to trade Trout for prospects? What would it take for the Phillies to get Mike Trout? Nola, JPC, Alfaro and Herrera? …..or much more. Such a trade just doesn’t make sense for the Phillies. You would think…… the loss of a JPC, a possible future Derek Jeter type player, would be a loss that would have to be overcome. The other parts could be replaced. But in a fantasy baseball world obtaining a Trout is what most GMs would dream about. How many championships does Trout have? How many playoff appearances?? Baseball is a team sport and you need lots of pieces. There will be no trade for Trout. If he wants to come as a free agent however, that would be pretty special. LOOK murray a lot of great players never won a championship. You cant measure trout greatness by championships. My point is that you don’t trade the farm for one guy in baseball, especially with free agency. Trout is too good to be traded, it would take too many players to make it a fair deal. No one player, no matter how good, is enough to win a ‘ship in baseball. What was surprising to me is how low Trout’s dWAR is for his first five years…..then more surprising when I compared it to Mays, Mantle and DiMaggio’s dWAR for their first five years….and, believe it or not, they were all in the relatively same ‘ballpark’. Though Trout seem to have a few more negatives. None you would think as Gold Glove candidates. Every hypothetical trade for Trout that I’ve seen involves the team acquiring him to basically give up anything of value they have, thus effectively putting them in the same position the Angels are in, if not a worse one. If I were the Angels, I’d open with something like Franco, Nola (must have those two), Hererra, Crawford, Thompson, Kilome. And I think there are people who would still say that isn’t enough. If Klentak, who knows quite a bit about Trout, ever tried entertaining such a deal, he would be wise to wait to later this season or next year …..if and when all the tier 1 Phillies prospects hopefully begin to prosper at AA/AAA levels would be the ideal time. Their value would be higher and he could get away with only giving up 3, maybe 4 at the most. When Detroit traded for Miguel Cabrera they gave up Andrew Miller (who had pitched in the majors but really didn’t pitch well) a top 10 prospect, a backup catcher and 3 more prospects who looked to have reasonable chances at being MLB players. Trout is better than Cabrera but it’s not like he is that much better than Cabrera was at the time of the trade. In my opinion Nola, (Franco or JP whoever they prefer), (Alafaro or Knap whoever they prefer), and then 3 more prospects anywhere from the 17-40 range. I’m not saying that Philly should make the deal because I don’t think they should. I think it’s unrealistic to think that the Angels are going to get 3 top 100 prospects and 3 legitimate cost controlled MLB players. Cabrera was traded after his age 24 season and had about 4 and a half seasons under his belt. Trout is in a similar spot now. Cabrera had accumulated 19.5 fWAR when he was traded and Trout is at 38.5, so the argument can be made that Trout is significantly better than Cabrera was when he was dealt. Plus, the Marlins were unwilling or unable to pay Cabrera the raise he was due to get in arbitration and they were eventually going to lose him in free agency. The Angels are under no pressure to move Trout, so any deal they make will have to make them feel confident that they won’t regret trading one of the best players in the game’s history before he turns 25. I was looking for the actual war that they had both put up through their first 4 years and I couldn’t find it anywhere so I was just looking at their offensive stats. I felt like they were very similar. Trout obviously was a much better runner early in his career but he has really fallen off the past two years. Miguel didn’t strike out as often as Trout and hit more RBI’s but he also didn’t score as many runs. I felt that they were very similar offensively and Trout is the much better defender I just didn’t think they were very far off. I understand that the Marlins were in a very different situation when they traded Miguel compared to where the Angels are now. The Angels aren’t desperate because they have Trout locked down to a long term deal. I will argue however that the Angels are going to become desperate to trade Trout in the near future because of repeatedly getting themselves into bad long term deals and continuing to sell their farm system for overpriced veterans. I went to Fangraphs to look up their WAR. I was actually surprised at the offense when I looked up their stats. In his first four full years, Cabrera put up wRC+’s of 129,146, 153 and 142. Trout, in his first four full years, put up 167, 176, 167 and 172. Even looking at more common stats that don’t adjust for the league: Trout had a better OBP and better slugging%. So, in addition to being a better fielder and baserunner, Trout was also a better hitter at the same age. I thought Cabrera might have an edge there, or at least be closer. We have a better chance of drafting a future Mike Trout than trading for the real one. I think that barring some unexpected performances in ST that Oberholtzer gets that #5 spot to start the season and Morgan opens in AAA. But, I have always liked Morgan and hope to see that fastball velocity up by 2-3 MPH. I just love all the positivity on this site. Maybe it’s the time of year, maybe it’s the potential future pieces we currently have. Or maybe it’s a combination of both. Either way, for a team that hasn’t had a winning record recently, came in dead last in 2015, and are projected to finish dead least in 2016, the vibes are strong. That’s what it’s all about. Let’s play ball!!! The hope is that our minor league teams all do well due to the stellar talent we hope we have. The major league team is looking at a 90 loss season unfortunately but let’s hope we see several playoff teams in the minors. Yet another position for Asche to butcher… 😂. But I have to give him credit: he is smart. Asche knows Klentak isn’t going to use him as an OF. With the Phillies prioritizing defense to make these pitchers look good for the trade deadline, Asche’s chances of seeing the field are ‘slim and none’ at 3b or LF. Unless an injury at 3rd he still the back up 3rd base man. I’D rather have him at first Base then Howard. I’m telling yea he goes to the cards they platoon him at at first and LF he hits .260 15 60 for a couple of yrs. Cards are really good with college guys . Philliies scout AJ Puk’s 2016 opening game start, Saturday night, Feb 20th. Severino Gonzalez is my sleeper selection. I read he gained a lot of weight and looks like a different person in ST. I would have picked him anyway going into his age 23 season. I probably won’t be able to post again for a couple of weeks so I won’t be able to reply to the post calling for sleepers this week, which is why I have to do it here. Unless he’s throwing a lot harder, it’s difficult to see him ever surging ahead of this very talented group of young pitchers – he’s almost entirely off the radar screen.